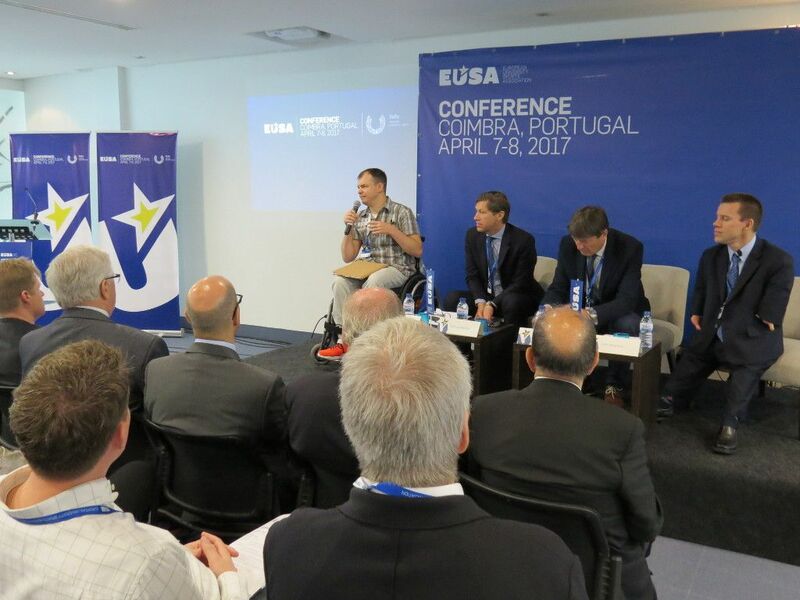 EUSA Conference 2017 entitled Fostering Inclusion and Well-Being through Sport, organised by the European University Sports Association (EUSA), in cooperation with the Portuguese Academic Federation of University Sport (FADU) was held on April 7 and 8 in Coimbra, Portugal – host of the European Universities Games 2018. Welcome speeches were given by the President of the European University Sports Association (EUSA) Mr Adam Roczek, President of Portuguese Academic Federation of University Sport (FADU) Mr Daniel Monteiro, Councillor of Sports and Youth at Coimbra City Hall Mr Carlos Cidade, FISU 1st Vice-President Mr Leonz Eder, President of FISU America Mr Alim Maluf Neto, and Asian University Sport Federation assessor Mr Ayub Hanafih. 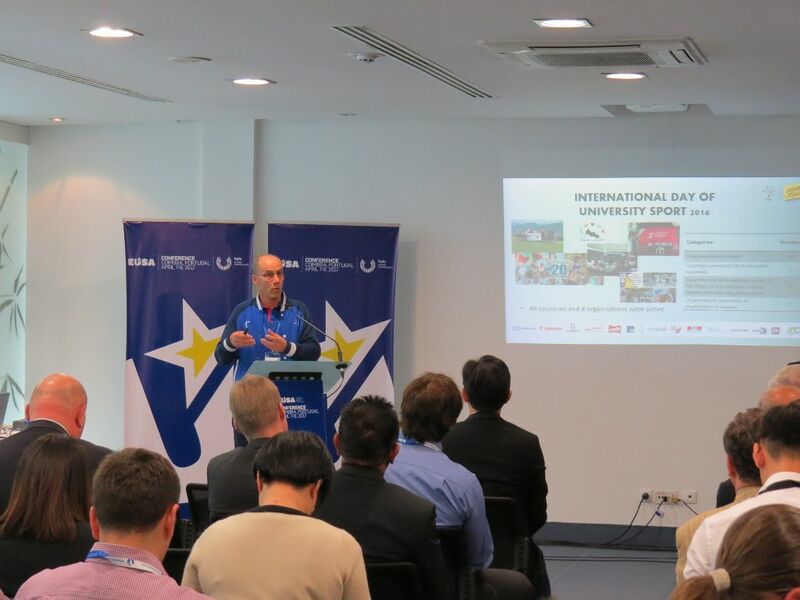 Over 150 participant from 33 countries from all around Europe and across the world participated in the event this year, held at the Tryp Hotel in Coimbra, supported also by the International University Sports Federation (FISU). 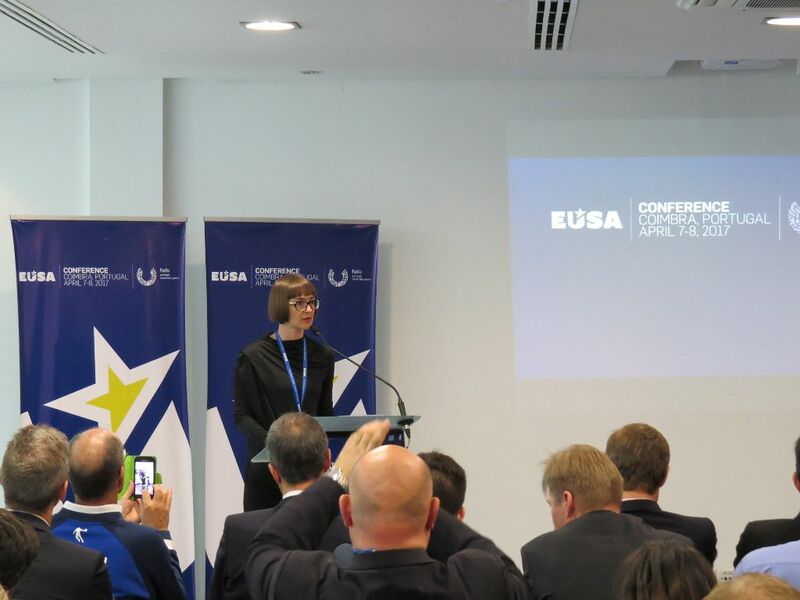 Among the participants were representatives of the EUSA member federations, universities, cities, international and continental federations, EUSA partners and events organisers. 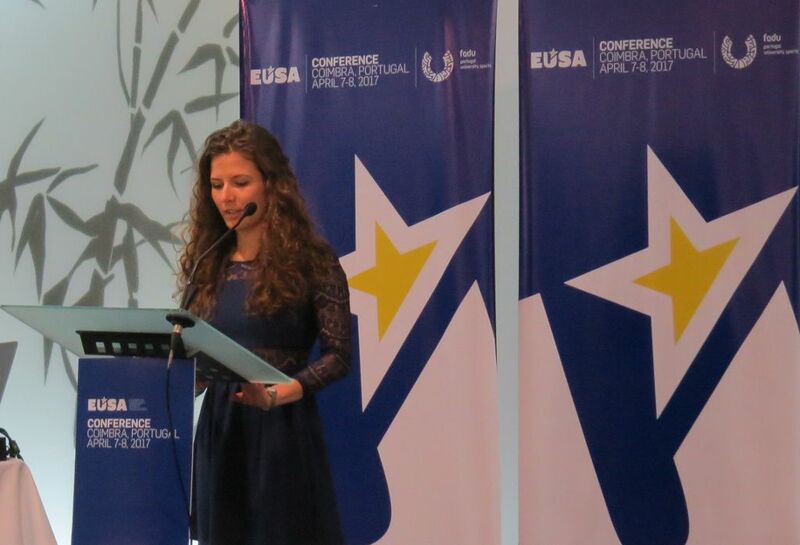 The main moderator and coordinator of the event was EUSA Education and Development Manager Ms Sara Rozman. Before the formal start of the event, the participants were invited for a #beactive morning run, and were also encouraged throughout the event to adopt the #beactive philosophy and way of life, even if by starting small - like systematically taking the stairs, active transportation, etc. 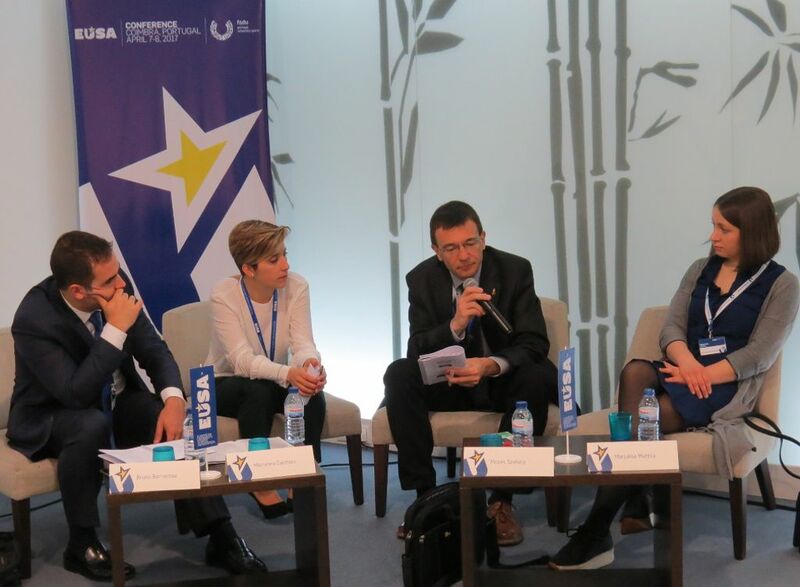 On Friday, the first plenary session entitled Using Sport to Promote Inclusion and Equality was moderated by EUSA Executive Committee member, Education Commission Chair Mr Milan Zvan. 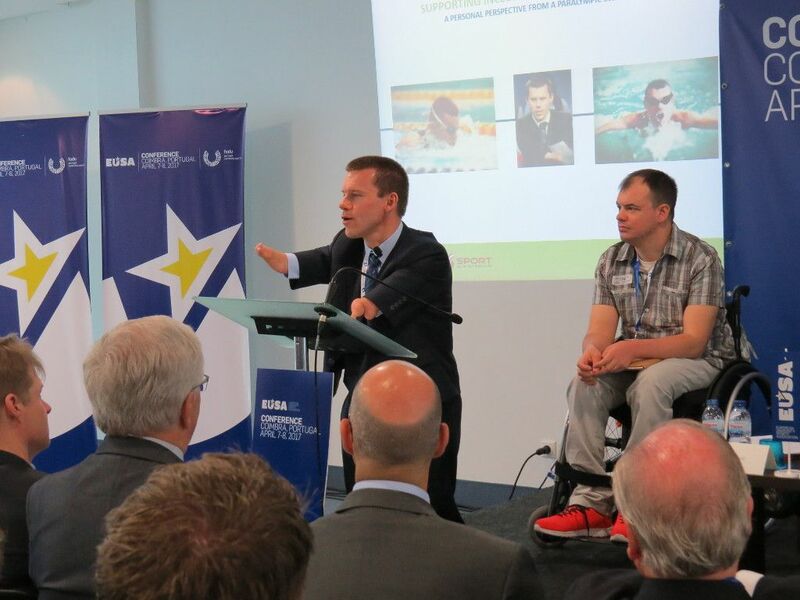 The first speaker was Mr John Petersson, President of the European Paralympic Committee (EPC), who provided an overview of the Paralympic movement and the inclusive nature of the latest edition of the European Universities Games. Providing a different insight to inclusion and equality, Head of the Sport Unit in the European Commission, Mr Yves Le-Lostecque described to the participants the role of grassroots sport in Europe and its role in building more inclusive societies and enhancing values such as tolerance, integration, and intercultural dialogue. Again providing a different perspective on this topic, Mr Eduard Blaskovic who volunteered at the European Universities Games in 2016, told the participants about his experience of inclusion and equality in sport. Being a person with a disability, Mr Blaskovic’s contribution to this topic was crucial in developing new ways to be inclusive and to provide equal opportunities for all. 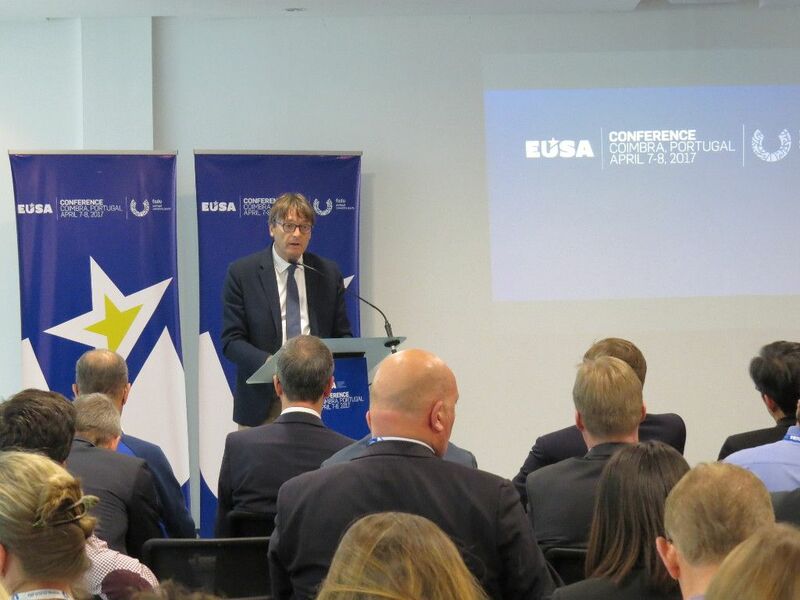 After the very successful edition of the European Universities Games 2016, the 2017 EUSA Conference reflected on this type of event in the next plenary session. 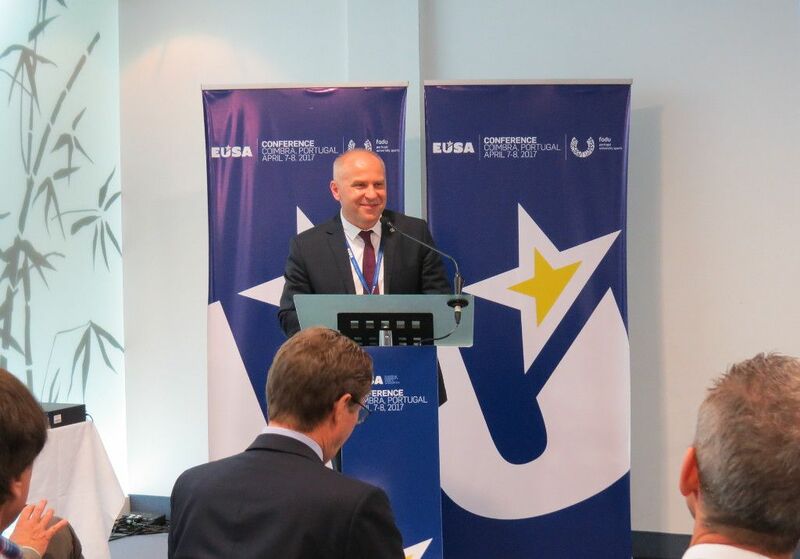 Providing an overview of EUSA, and explaining how the idea of European Universities Games came about, EUSA President Mr Adam Roczek took the stage, inviting also EUSA Honorary President Mr Alberto Gualtieri to share his insight on the preparation of the inaugural event in 2012. Mr Roczek not only expressed his happy feelings on how the European Universities Games are now structured, but also posed the question how the games can develop and grow in the future. 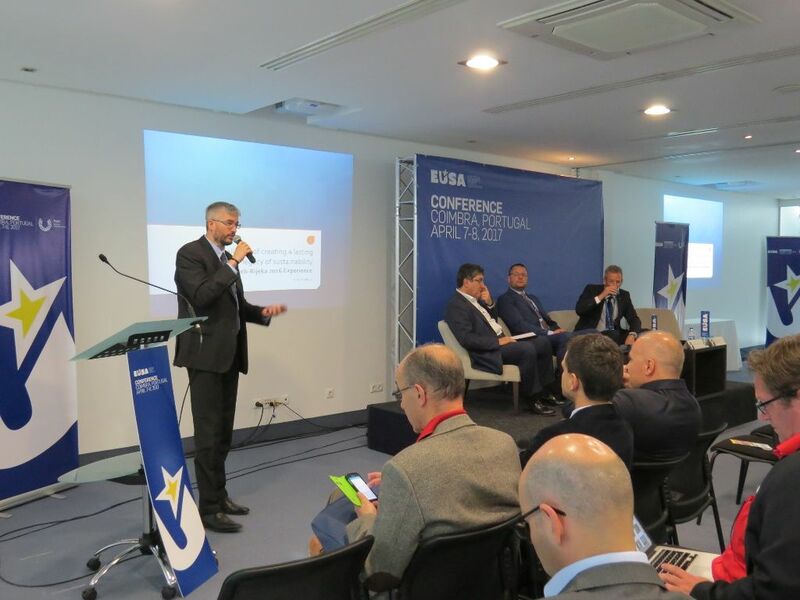 Olympian Gordan Kozulj, Chairman of the European Universities Games Zagreb and Rijeka 2016 Bidding Committee, expressed his pride of the success of EUG2016, sharing with the audience how the team that worked on the games was able to deliver the biggest, and best Games in the history of EUSA, and what were the main pillars and legacy outcomes of the event. 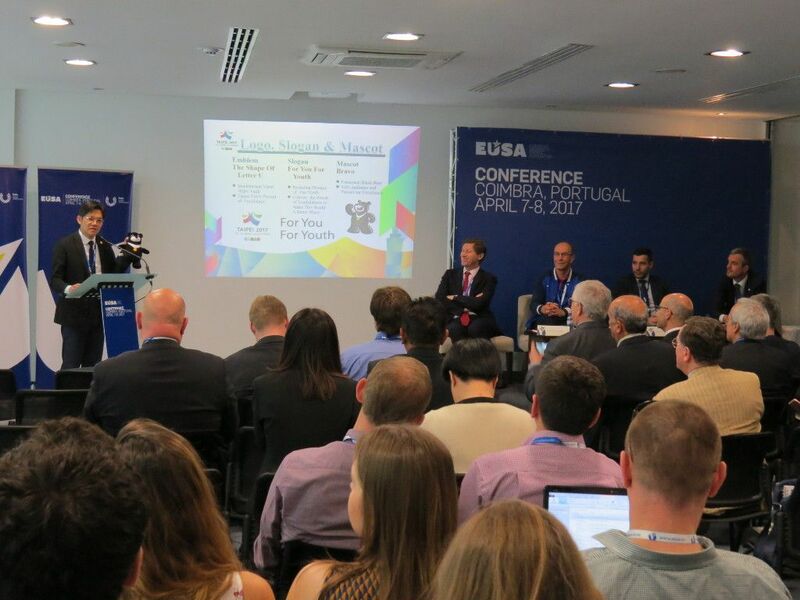 The next edition of the European Universities Games was also presented, with Mr Mario Santos, Secretary General of EUG2018, providing an overview of the work that has been done so far on the event, and how Coimbra will learn from Zagreb and Rijeka. He stressed that even though the event will not be as extensive, the aim is to be successful and enjoyable for all participants, also leaving important legacy for City and University of Coimbra. 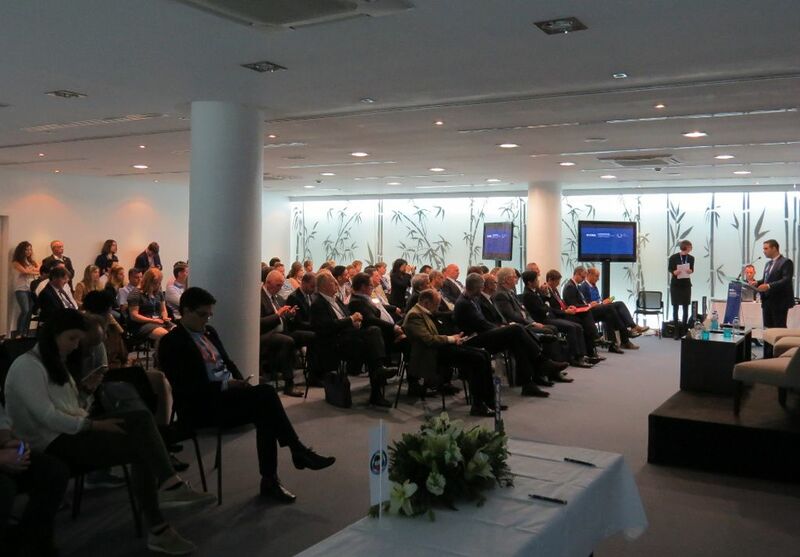 The conference continued into the afternoon, with two parallel workshop sessions offered to the participants. Ms Anna Edes, Chair of EUSA Student Commission, moderated workshop No.1 entitled ‘Providing a Place for Volunteers and Opportunities for Youth’. 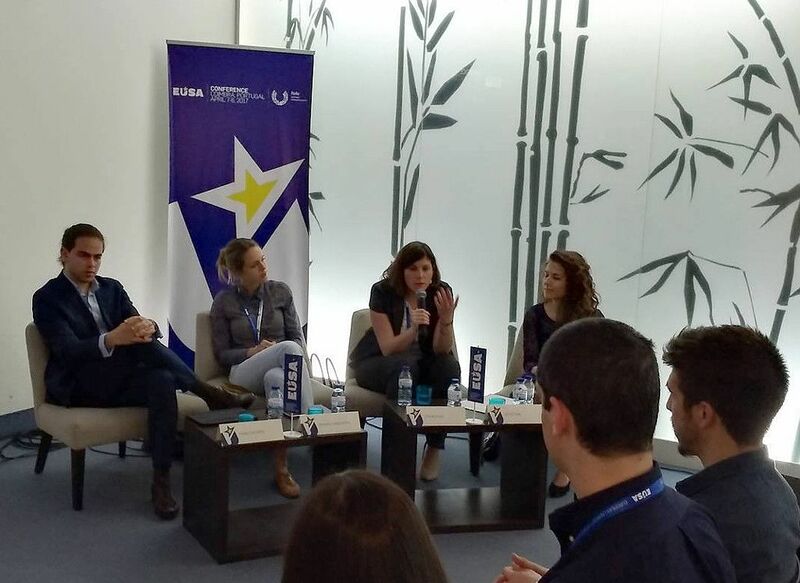 She was joined on stage by Ms Ivana Ancic sharing the volunteers experiences at the European Universities Games Zagreb and Rijeka 2016, Ms Nevena Vukasinovic from ENGSO Youth presented the European Youth Sport Forum 2017 and the Pink Paper recommendations, and Mr Hugo Carvalho from the Portuguese Youth National Council shared his views on the importance of youth involvement. 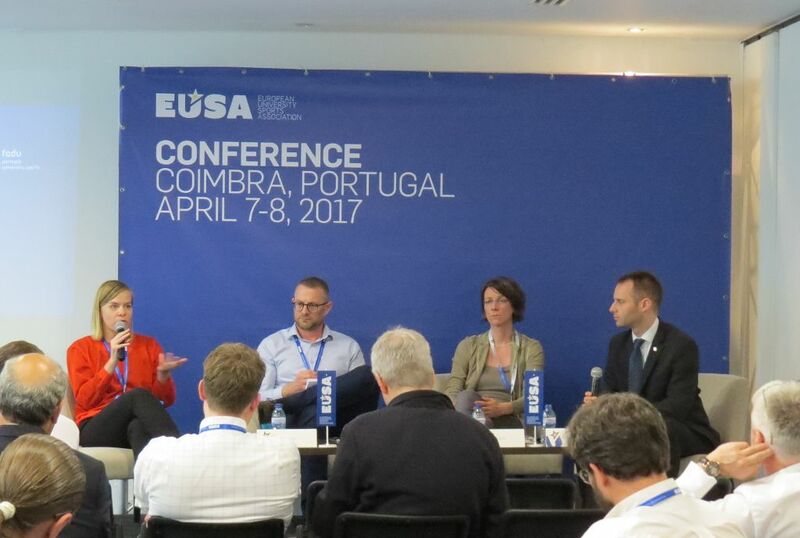 Workshop No.2 focused on safeguarding in sport and was moderated by EUSA Communications and Projects Manager Mr Andrej Pisl. The first speaker Ms Heidi Pekkola from the European Non-Governmental Sports Organisation (ENGSO) shared information about SCORE Project, discussing the results of the gender equality project, which was conducted across Europe the past two years. Ms Bettina Rulofs from German Sport University Cologne next presented VOICE project, the ongoing project tackling sexual violence in sport. Mr Neil Rogers discussed #takeastand campaign, run by the British Universities and Colleges Sport (BUCS) in the UK, tackling several threats in university sport and making it as inclusive and open as possible. The day’s last session focused on the challenge of creating a lasting legacy of sustainability within the sports event world. 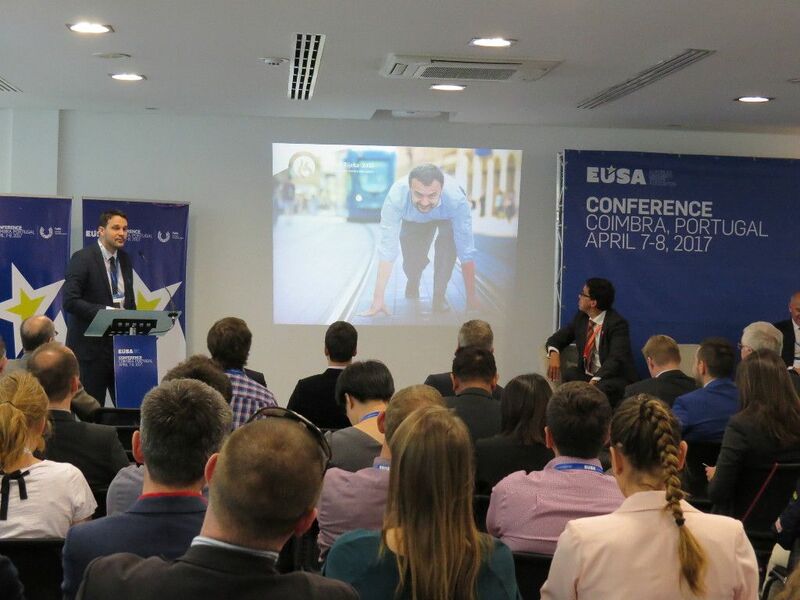 Moderated by EUSA Treasurer Mr Lorenz Ursprung, the plenary session started with a presentation about the European Universities Games Zagreb and Rijeka 2016 lead by Mr Haris Pavletic who shared with the audience the steps they took to ensure that the games had a lasting legacy, and the infrastructure would be used in the years to come. 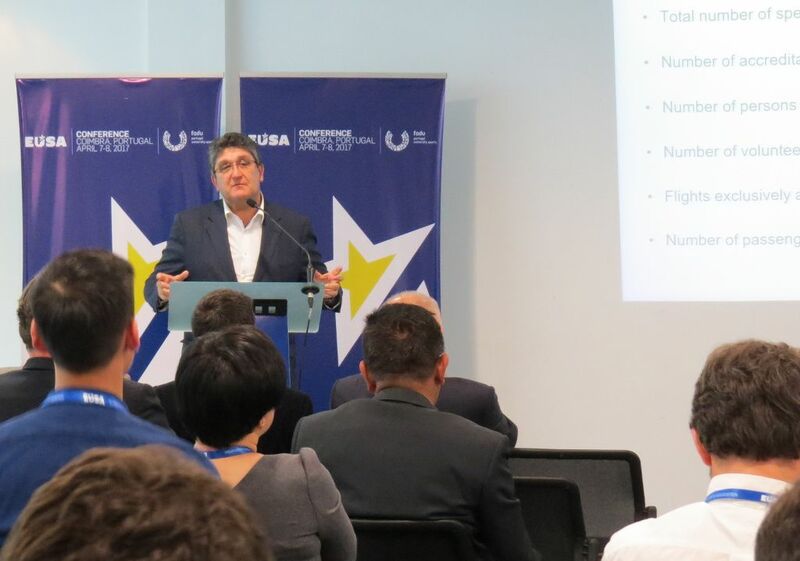 Giving even more insight into how event organisers in the world of sport plan not only for the game time activities, but also how to plan to create legacy after the competitions have finished was Mr Radomir Jovovic from the 2009 Summer Universiade in Belgrade. 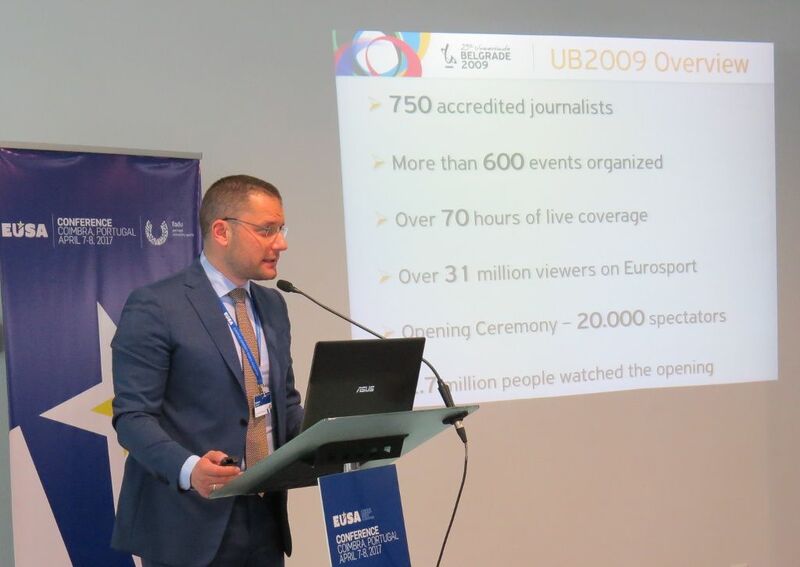 He spoke about today’s perspective on the event back in 2009, and also shared with the participants the planning procedures for the European Universities Games 2020, to ensure the events venues would be used in the years to come. Going even further back in time, Secretary General of the Portuguese Football Federation, Mr Paulo Lourenco provided detailed of how they ensured lasting legacy of the EURO2004 football championship. Among other aspects, he described how the whole country was passionate about the event, helping them ensure public support. The day concluded with recaps of both workshops so that all participants knew what was discussed in each of the parallel sessions, and the first official day of the conference ended with the viewing of the update EUSA Exhibition to include the amazing events that have taken place in recent years. The second day of the conference kicked off with a set of two parallel sessions, workshops focusing on two important areas of university sport in today’s world. 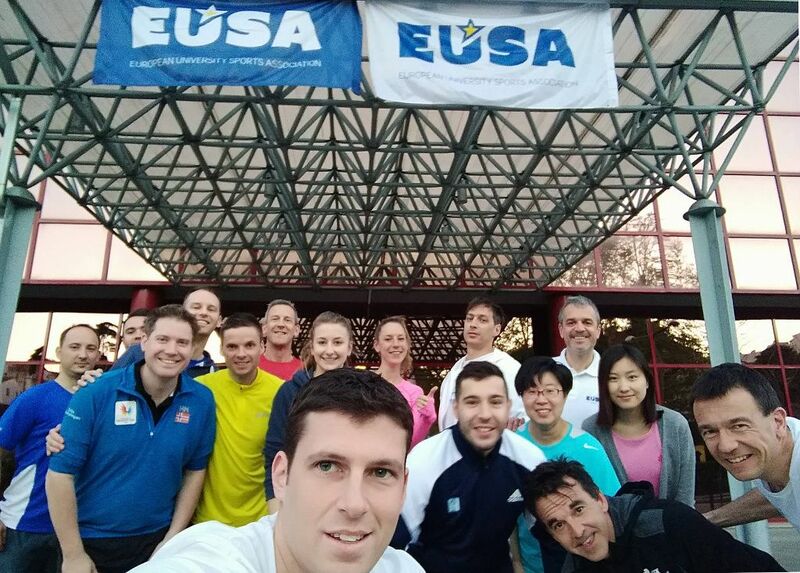 One focused on Engaging Students – Good Practices in which the national university sport associations from across Europe were invited to provide insight to the realities of their country. Moderated by EUSA Executive Committee Member Mr Bruno Barracosa, the session featured Mr Mozes Szekely from the Hungarian University Sports Federation (HUSF), Ms Marianna Cardoso from the Portuguese Academic Federation of University Sport (FADU), and Ms Marjukka Mattila from the Finnish Student Sport Federation (OLL). The other workshop looked at Ways to Use Social Media to Promote the Sport Events, and was moderated by EUSA Executive Committee Member Mr Bill Thompson who is also the Chair of EUSA Media and Communication Commission. Mr Leonz Eder and Mr Fernando Parente represented the International University Sport Federation (FISU) provided insight into how FISU uses social media as a way to promote their sport events. The session continued with Mr Charles Camenzuli from AIPS Europe, contemplating the Social Media vs Traditional Media situation we have within sports journalism at this current time. Social media expert Mr Christopher Halder from Grand Union was last to present, again continuing to discuss all the useful ways in which social media can be used to promote sport events. 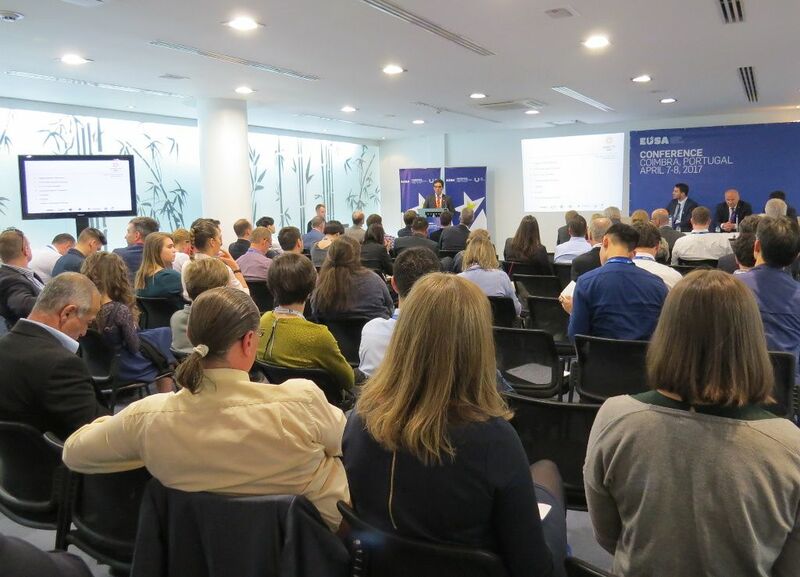 The fourth plenary of the conference gathered all of the participants together for the final session, entitled Activating Europe, and included speakers from the European Commission, FISU, and EUSA. The session began with the FISU’s 1st Vice President Mr Leonz Eder, who shared how the International Day of University Sport (IDUS) has been able to promote sport at universities and the rest of the public. Proclaimed by UNESCO on the initiative of FISU, the day is celebrated on September 20th every year and aims to motivate students and higher education employees to be more active. At this occasion also Mr Shih-Ming You, Deputy CEO of the Summer Universiade in Taipei City presented activities planned for this largest university sport event, governed by FISU. 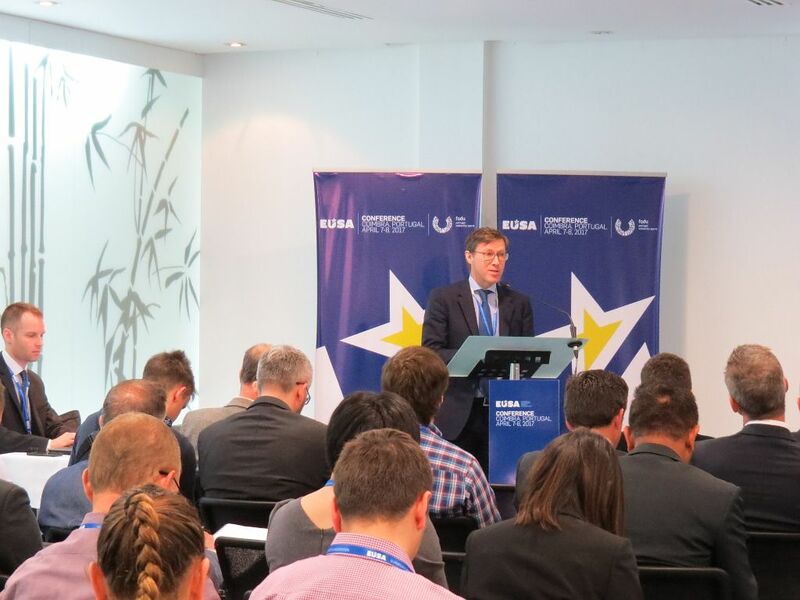 Head of the Sport Unit in the European Commission, Mr Yves Le-Lostecque shared the general aims and tremendous success of the past two editions of the European Week of Sport. As of 2017, the European Week of Sport will be held between September 23 to 30. The week is for everyone, with a focus of grassroot sport. Together with national coordinators and partner organisations, among which EUSA is also one of them, the campaign is set to inspire Europeans to #beactive and encourage them to be physically more active and exercise throughout the year. The final speaker of the day gave insight into future events in EUSA, with specific focus on 2017. 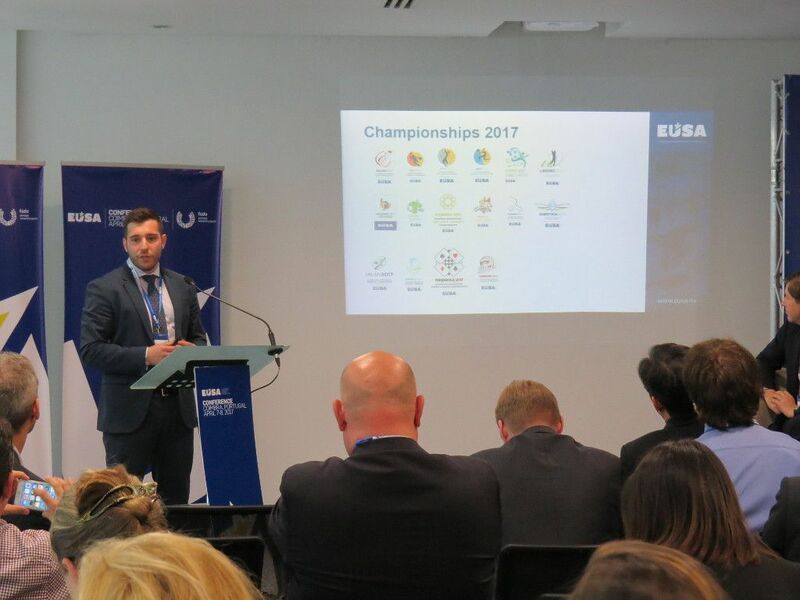 EUSA Sports Manager, Mr Besim Aliti shared with the participants the European Universities Championship programme for 2017, which includes 19 sports in 14 cities across Europe this summer and autumn. Alongside this, EUSA is also endorsing 8 patronage events in 2017. 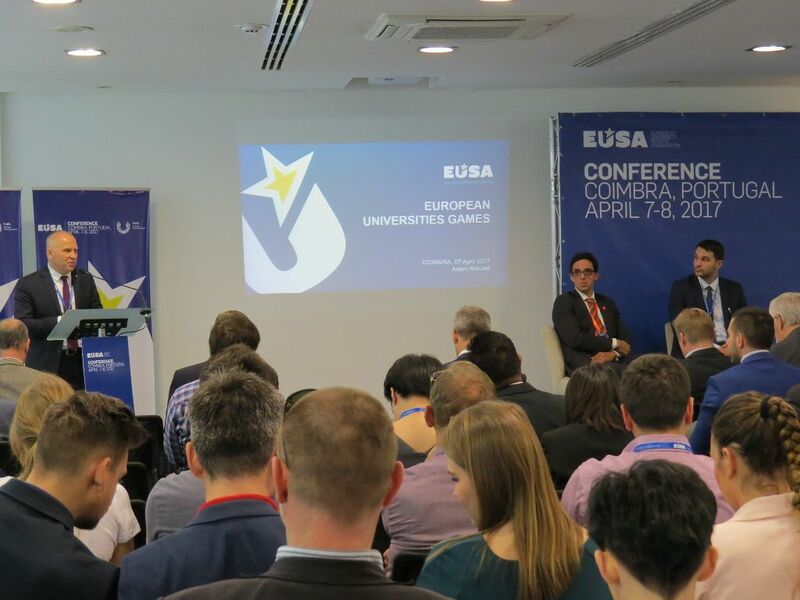 EUSA Executive Committee Member and Chair of the Education Committee Mr Milan Zvan wrapped up the conference, providing an overview of the event, and thanked the speakers, moderators, the hosts as well as participants for their contribution in the discussions which took part in each session. 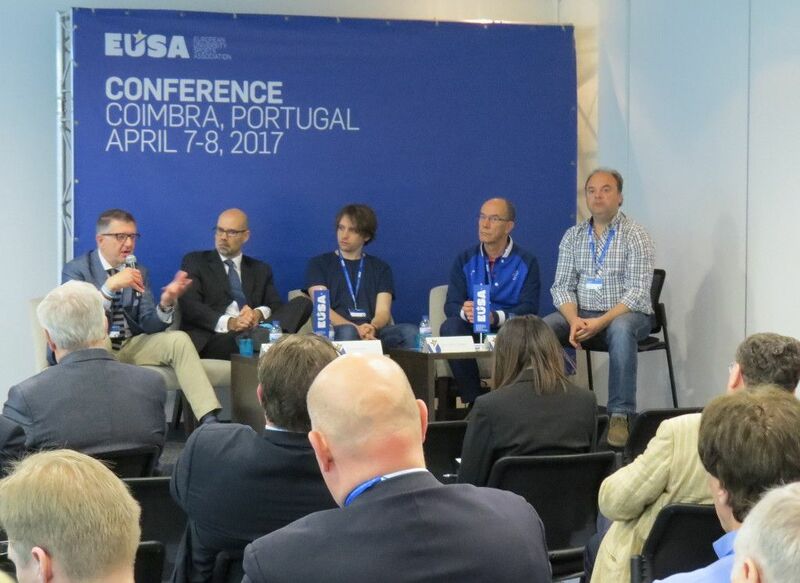 Once EUSA Conference 2017 has concluded, the participants were invited to see more of the city of Coimbra, including a venue visit of the European Universities Games 2018. This part of the day started at the University of Coimbra, where the participants visited the UNESCO heritage University of Coimbra - Alta and Sofia and the famous Joanine Library, stunning Baroque building situated in historic centre of the University. After a further tour of the complex, the participants visited venues, which will be used during the EUG next year. To conclude a packed weekend of activities, Saturday evening entertained a spectacular EUSA Gala in the extraordinary Sao Francisco Convent in Coimbra. 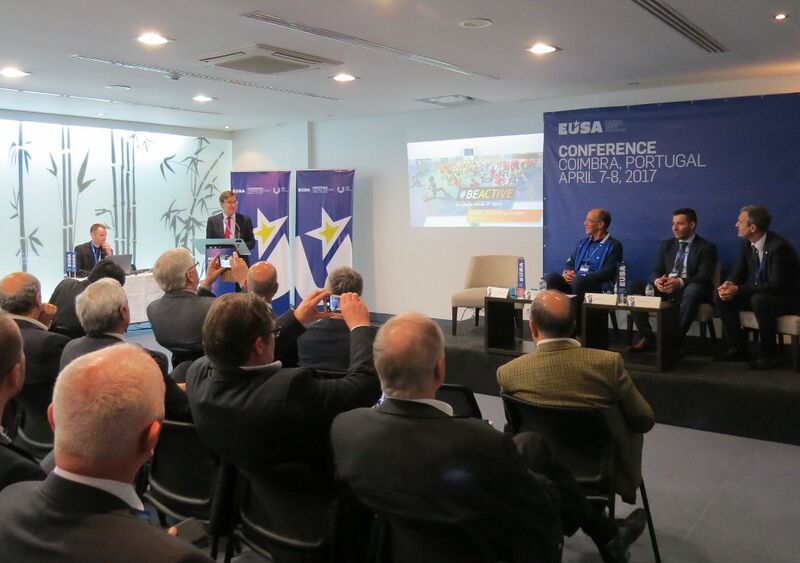 The EUSA Conference and Gala are supported also by the International University Sports Federation (FISU).